Retro pin-up inspired knee length plus size high waist wrap skirt is a must have. Wear with a blouse, turtle neck, tank top or t-shirt. I like to create pieces which are timeless and created to last. This will be your go to piece.for fall all the way through spring. Made using a medium weight polyester cotton twill. Perfect for Spring Summer, Fall, and Winter. Don't know what twill is? Denim is considered twill. This plus size skirt is sturdy yet provides a beautiful drape. The plus size skirt has a "4 wide band (which acts as a corset) to hold you in, and a long belt which can be worn by some in the back or front. This skirt works for plus size, regular size, petite, tall... all shapes and sizes. 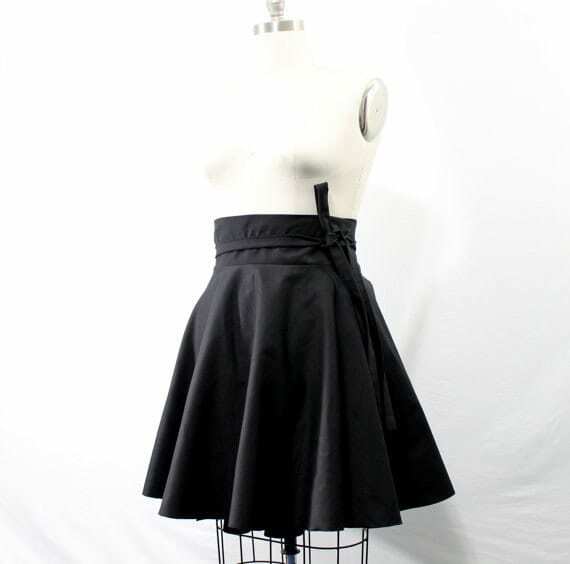 Beautiful, versatile, well made skirt. The weight of the fabric makes it hang beautifully with no effort and the length is perfect for a short gal like me- hits at the magic leg slimming spot! Looking forward to many holiday events with this as the foundation for the outfit! Excellent quality, this skirt is bomb.